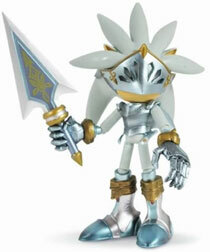 This page covers only figures from Sonic & The Black Knight for the Wii. There were plenty of new character models to chose from in the game, with new clothing or armor. 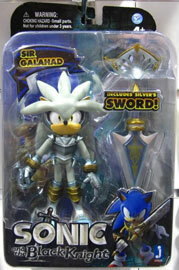 Jazwares did several figures for the game, with early ones being only Sonic with one gauntlet & the sword from the beginning of the game. Later, they added full armor figures with a new style of joints. Various releases had different box types, & some were Toys R Us exlcusives too. 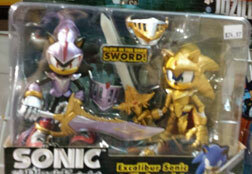 Find full reviews & all photo turn-arounds for all of the Sonic Black Knight figures here. Full review pending actually getting this figure.